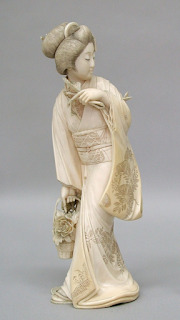 PennsylvAsia: "'Japan is the Key…': Collecting Prints and Ivories, 1900–1920", March 30 to July 21. "'Japan is the Key…': Collecting Prints and Ivories, 1900–1920", March 30 to July 21.
presents highlights from Carnegie Museum of Art’s significant collection of iconic Japanese woodblock prints (ukiyo-e) in an entirely new way, uniting them with Carnegie Museum of Natural History’s holdings of exquisite Japanese carved ivories (okimono). These collections were formed in the early years of the 20th century, motivated by European and North American acceptance of Japan as an emerging modern power, and the aesthetic appeal of Japanese art to artists and collectors. Japan is the Key… tells the story of two very different men who promoted Carnegie Institute’s early interest in Japanese art: poet and critic Sadakichi Hartmann, who masterminded the Department of Fine Arts’ controversial exhibitions of Japanese prints in the first decade of the 20th century; and ketchup magnate H. J. Heinz, who acquired ivories on his world-wide travels on behalf of local industry and religious organizations. This exhibition offers a rare view of this period of cultural interchange through the lens of the personalities that shaped it. 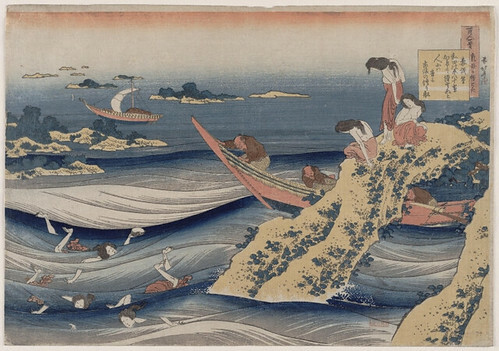 Japan is the Key… features over 50 rarely-seen Japanese prints, including traditional masterworks by Hiroshige Andō, Katsushika Hokusai, Utamaro Kitagawa, and Kunisada (Toyokuni III), as well as highlights from Carnegie Museum of Natural History’s collection of Japanese ivory figures of people, animals, and gods. Much more background information available in the January 15 press release. Additionally, on April 18 the museum will host a "salon-style conversation" on the exhibition. Admission for the "Culture Club" event is $10, which includes the ticket, the discussion, and a drink. The title comes from a quotation attributed to HJ Heinz: "Japan is the key to the Orient." It comes from a letter read at the Tenth International Sunday-School convention in Denver, Colorado, June 1902, and refers to proselytizing in East Asia. Japan is the key to the Orient. The work done through this Sunday-school movement and through the missionaries in this ambitious, aggressive, imitative nation, so eager to adopt the methods of the United States, will be looked upon with favor by the neighboring people of Korea and China. It is "judicious advertising" to four hundred million Chinese, of the great Sunday-school movement, destined to become world-wide in its scope, and of blessed results. The expression gained more currency a few years later, when James A.B. Scherer wrote in his 1904 book Japan To-day: "Japan is the key to the Orient, but no one has ever found the key to Japan." tells the story of a tightly knit group of travelers--connoisseurs, collectors, scientists--who dedicated themselves to exploring and preserving what they referred to as Old Japan. A sense of urgency impelled them, for they were convinced--Darwinians that they were--hat their quarry was on the verge of extinction. Most were New Englanders and several were hired by the Japanese to impart instruction on modernization in the Western mode. But they left Japan persuaded that preservation of the old was far more important than aping of the new. They were joined in this view by several prominent Japanese officials . . . In one sense, Old Japan vanished at the moment of its discovery. "For Old Japan was like an oyster:--to open it was to kill it," as the longtime resident Basil Chamberlain lamented. But it turned out that something of Old Japan--like the shrines carried in the great Shinto festivals--was portable, and recoverable. It could be relocated in Boston, or Chicago, or Washington, D.C.--even in the White House itself--and assume a second life. This recovery was the work of men and women who realized that to open Japan culturally meant to open themselves in turn, and to risk transformation in the process. Admission to the museum is $17.95 for adults and is open from 10:00 to 5:00 Tuesdays through Saturdays, until 8:00 on Thursdays, and 12:00 to 5:00 on Sundays.